Specifically designed to target anger management problems, this powerful self hypnosis program will help you control your emotions when you feel anger is creeping in. The deep relaxation and spoken hypnotic techniques on this CD or MP3 will help you balance your anger by creating new patterns that will take effect each and every time you become angry. Anger problems normally occur due to the inability to control any given situation and the inability to calmly express how they feel about a given issue. By re balancing the driving emotions that cause angry outbursts you are able to tackle this problem head on. 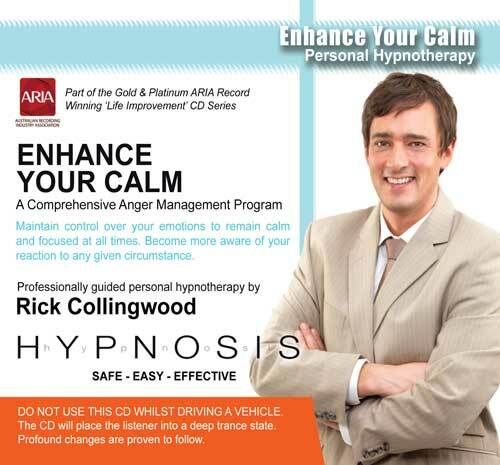 As with all of the personal hypnotherapy audios on this site, 'Enhance Your Calm', if used daily according to instructions, will take you into a regular pattern of deep relaxation. This alone is imperative to helping control the emotions that cause anger. In fact, with a good night's sleep and a daily routine of entering into the realms of deep relaxation, you will make already be making significant improvements towards being calmer and in control. To further the process of dealing with anger issues, there is also a number powerful hypnotic direct suggestions on this recording that will embed in your deeper mind the automatic ability to find new ways of dealing with situations that make you angry. It will give you the power to replace feelings of anger with other more positive feelings and to develop a sense of calmness that are more conducive to properly solving problems and maintaining relationships. Remember that the power lies within you. If you always do what you have always done then you always get what you have always got. Controlling anger issues is a big step forward to making a better life for yourself and the people around you. I have used the CD’s. I have used Enhance Your Calm 5 or 6 times and Happiness and Self Esteem once. I have (honestly) been blown away by both of them. When I was using Calm consistently I could tell a difference in my demeanor and even now being about 3 weeks removed from my last use still feel pretty mellow during times when anger used to take over. After I used Happiness and Self Esteem I noticed about 3 days where my confidence was higher than it had been in a long time. I have yet to return to that one but really, really have liked the results. Sometimes it takes about 2 minutes for me to go under, sometimes it takes about 20 minutes and only once have I come back in the middle of a session but that was when I was on a flight from Mexico to LA. I am genuinely a fan of your CDs and have been telling people about them. Although they are skeptical I think my recommendation makes them listen because I am not one to praise something I don’t believe in.